Each December invariably brings, along with candy canes and fruitcake, Christmas albumsfor better or worse. This year, Scottish songstress KT Tunstall has cut a six-song holiday EP that is definitely better. The album kicks off with a cover of The Pretenders’ seasonal favorite “2000 Miles,” on which Tunstall sounds like a dead ringer for Chrissie Hynde until hints of her raspy brogue start to sneak through. On the rockin’ “It’s Christmas (Baby Please Come Home),” Tunstalll holds a candle to Bono’s version of the Phil Spector-penned tune, which is no small feat. Still, the highlight here is a cover of The Pogues’ “Fairytale of New York.” Sung as a duet with Ed Harcourt, Tunstall brings a fiery beauty to Shane MacGowan’s brilliant, twisted lyrics about love, addiction, jail, and, well, Christmas. 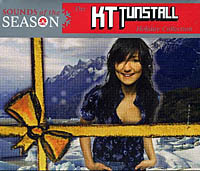 Lively and pleasing, Tunstall’s choice of tunes is sure to put even the staunchest Scrooge in the holiday spirit.